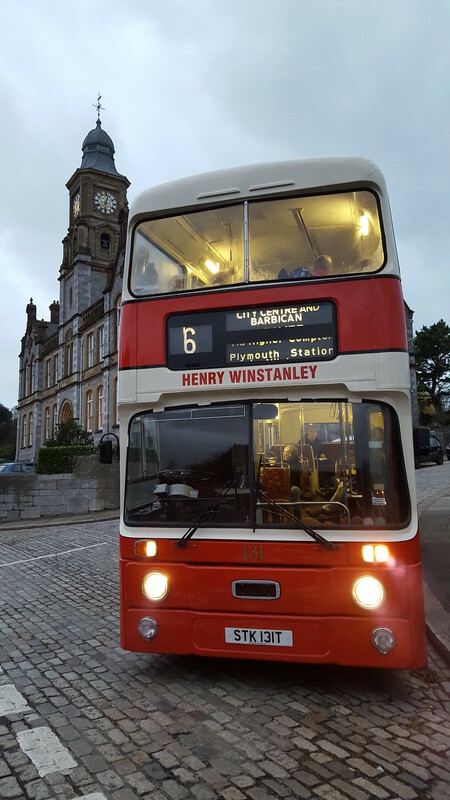 This weekend members of the Plymouth City Transport Preservation Group (PCTPG) enjoyed an evening out on a late 1970s former Plymouth double decker Leyland bus on a tour of some of the citys former tramway routes by twilight. The event held on Sunday evening with nearly 50 members of the group in attendance visited some of the key points in the city that were associated with its tramway past. 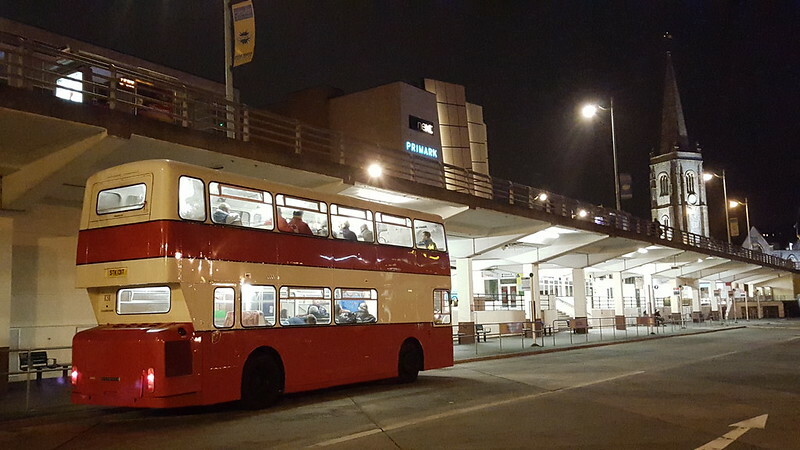 The 1978 Leyland Atlantean in full Plymouth City Transport livery retraced 4 former tram routes as much as is possible over 60 years since the last trams in the city ran in September 1945. A lot of the city layout has changed in the intervining years especially with the heavy bombing Plymouth suffered but it is still possible to retrace some of the original routes at least in part. 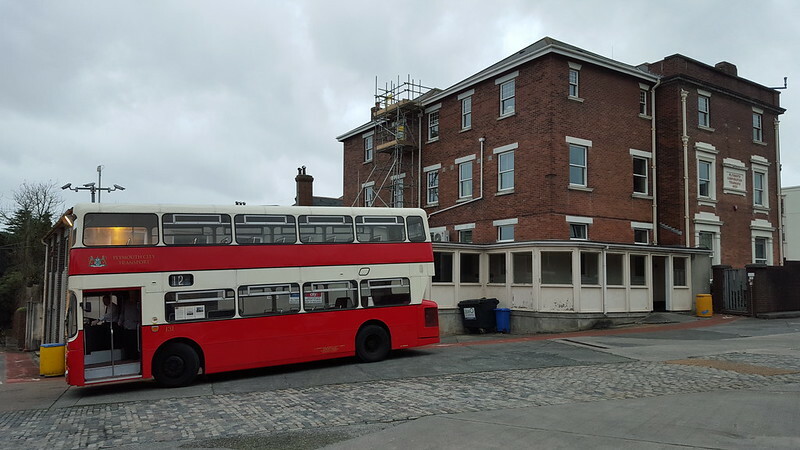 The tour took members from Cattedown across the city to Devonport to Peverell, Compton and the Barbican as well as across the city centre with a stop for some final pictures in Bretonside before it closes followed by a fish and chip pit stop at the Mayflower steps. Very little of our tramway past remains standing or visible but a few former pieces can be seen as we passed through some of the city streets most obviously the green tramway pole from 1898 on North Hill. Many thanks to Ralph, Jason, the vehicle owners, drivers and anyone else who helped organise this excellent and very enjoyable tour. 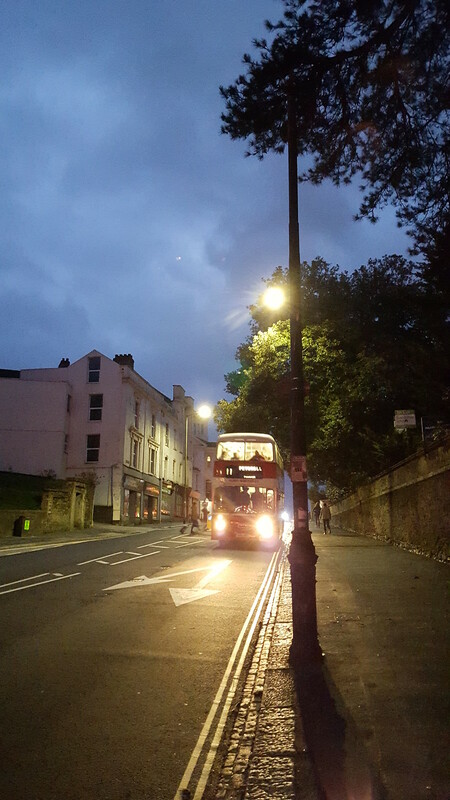 It was not long ago that there was an almost complete line of tramway overhead-line poles and brackets in use as street lamps - along Wilton Road and Paradise Road as far as the City College. One of these is left now - on Wilton Road near the Co-op. There is also a very rusty one half hidden under a tree by the traffic lights at the end of Paradise Road. I seem to remember there also used to be quite a few of these between St. Budeaux and Saltash Passage. Another relic which lasted until a couple of years ago was an old tram stop post being used as a bus stop about half way along St. Levan Road. Considering these tram routes were abandoned in the 1930s, that's not bad going. I can remember when I was a young seeing tram tracks in front of what is now the Bank pub - I think this is where the 'Theatre' terminus was. And, of course, there are still tracks inside the oldest part of Milehouse depot. Is Plymouth now ready for second generation trams? By French standards it is a big enough city and there are certainly some heavily-used routes. If Brest can do it, Plymouth can! There is a plan gathering dust somewhere for trams and ‘tram-trains’ which was to involve a park-and-ride at Trerulefoot and a service from there through the city centre to Plympton; also a link with the Gunnislake line. Plymouth probably has enough space for a high-floor system like Manchester’s. I remember seeing tramlines uncovered in Exmouth Road, Devonport (between Albert Road and Portland Road) in the late 1980's when a gas or water leak was being rectified. I also saw tramlines briefly exposed in Devonport Road (between the Waterloo Street and Nelson Avenue) in the early 1990's. I wish I had taken some photographs for the record. There must still be quite a few mile of rail buried beneath the tarmac in the city. Unfortunately it had broken down quite early in the tour and needed a tow back to the depot.